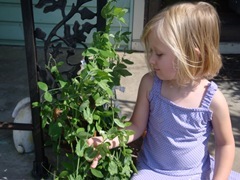 Anna helped pick some peas, lettuce and herbs the other day. She thinks it is so cool that she has her own pea plants. 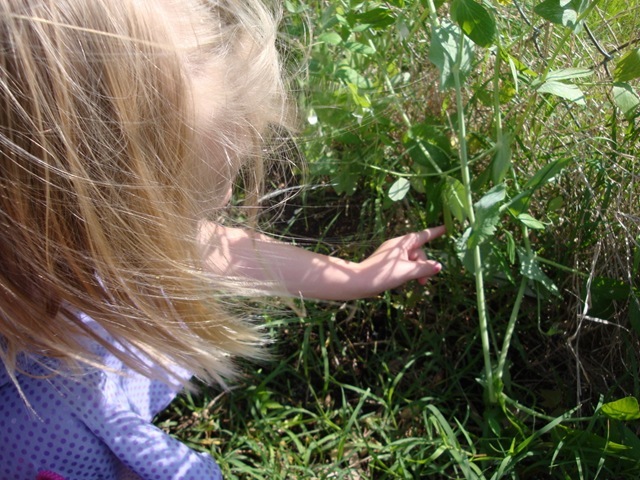 I have to keep the girls from picking the peas too early. They would have the plants scalped every time they walk out the door. It was sunny and hot one day this week. It has rained and been cloudy all the rest of the days. The garden is hanging in there. Everything is looking okay. Hope it dries out soon. I have been reading a great book: Four Season Harvest by Eliot Coleman. I would recommend it to anyone interested in vegetable gardening. Yall take care now! So far so good…the tomatoes are still alive and looking good. I even have a few little tomatoes. Some of the other plants are struggling. The eggplants are looking real bad and the peppers are hanging in there. Of course, the weeds are great!! 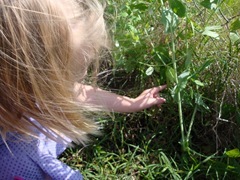 The girls and I ate some yummy snap peas this morning as we were leaving for school. I planted some of the peas in the front flower bed on the south side of the house and they have loved this spot. All of the plants are covered in blooms and fruit. They are vining right next to the steps on the porch, so we get a tasty snack every time we walk past. The best way to get kids to eat their veggies-make it fun! It is fun to pick them as they go past. The girls would not be so thrilled if I plopped snap peas right on their dinner plate and told them to eat up! Happy gardening and I hope the sun is shining wherever you are!